Please plan to join us on Sunday, September 16, to celebrate 100 years at St. John the Divine in Southwest Harbor at the 10:00 a.m. service. There will be special music; a history display of photos and newspaper articles in the undercroft; and a birthday cake! An extended Prelude by Cate and Jane Pope will begin about five minutes before the service. Please come early to settle in before the festivities begin. Friday, September 14 – 7:00 p.m. Suggested donation is $10 – ALL proceeds go to the Westside Food Pantry which provides food vouchers for local residents during the winter and spring months. Bishop Lane is Coming to MDI! 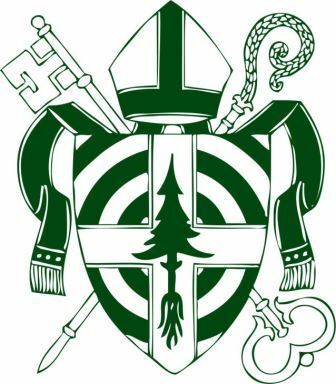 Friday Evening, September 21 – 5:00 p.m.
Bishop Lane is coming to MDI for his final visitation before he retires. To honor him, the four parishes are hosting a Harvest Dinner at the Hulls Cove School House. Sign up sheets in the undercroft. Saturday, September 22 – 9:30 a.m.
All are invited to a prayer service at St. John's at which time Bishop Lane will give a birthday blessing for our 100th anniversary. Following the service St. John's vestry will meet with the Bishop. Sunday, September 23 – 10:00 a.m.
Don't forget that the four MDI Episcopal parishes will have a joint service at St. Saviour's in Bar Harbor during Bishop Lane's visitation. There will be no other services that day. September 9: Holy Eucharist and Annual Picnic at Suminsby Park, 11 am. No service at St. Mary's by-the-Sea. Rain location: the Parish Hall at 5 Kimball Road. Our Thrift Shop will be open on Saturdays from 9-12 and Wednesdays from 3:30 to 6 pm. Families First Community Center: Raffle tickets are on sale for a queen size quilt made by the Island Quilt Guild (several of St. John's women are part of this guild and helped make the quilt). The drawing will be held at Families First second annual Gourmet Dinner at Big Cat's Catering in Trenton on Sunday, September 9. You need NOT be present to win! Tickets ae 2 for $5 or 5 for $10. For tickets, e-mail familiesfirstellsworth@gmail.com or call 460-3271. Michael Shook, Paul Milligan, Douglas Mays, Dorothy Clunan, Anne DeGolyer, Jackie Mayhew, Betty Mitchell, Cody Van Heerden, Jim Risser, Scott Hatcher, Ray McDonald, Janet Meryweather, Bill and Barbara Loveland, Win Short, and Bob Theriault.